Architectural Outdoor Lighting in New Irving Park, NC 27408. PROJECT SUMMARY: The front elevation of the home was all this customer was interested in. 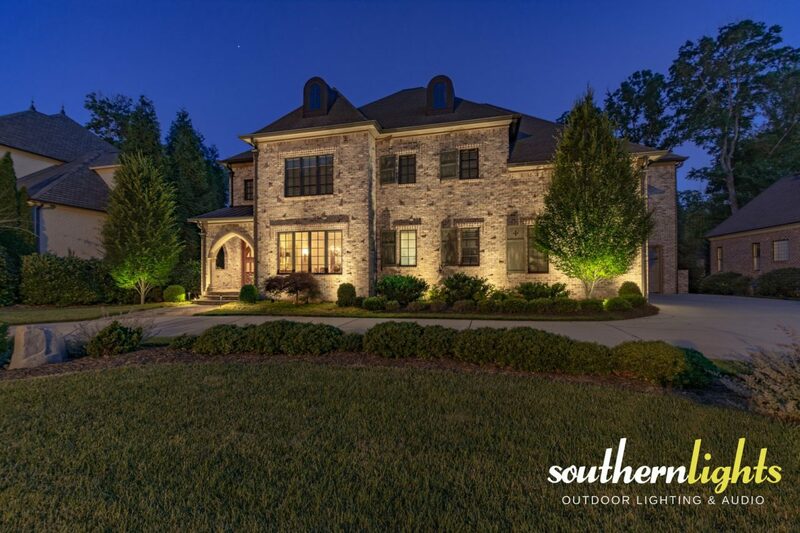 Southern Lights choose to softly graze the brick work and highlight this homes architecture with beautiful outdoor lighting. LANDSCAPE LIGHTING FOCUS: The Brick work and architecture of the home was the main focus, along with some safety lighting at their front steps. LANDSCAPE LIGHTING FIXTURES: 100% made in USA Clarolux Landscape Lighting Fixtures. Clarolux FL36 “Lawndale” Flood Directional Brass, Clarolux AL1 “Barletta” Area & Path Light Brass. LOCATION: The lighting designs and installation for this project can be New Irving Park, NC 27408. Next to no hurdles on the outdoor lighting project. Many times, Southern Lights doesn’t have the opportunity to install outdoor lighting before the plants are installed creating additional challenges with fixture placement due to plants obstructing light. Southern Lights was fortunate on this project to be able to come in prior to plant installation and place fixtures in their perfect location. The plant material was then positioned around the outdoor lighting providing a better long term, lower maintenance need for pruning and light fixture relocation.